STARLAND has been established for more than 60 years and holds the brand “Ho Hau Ice-Cream“ which represents high quality assurance. The Founder, Mr. HO Shue Tong, adhered to the harmony concept of Tai Chi (太極), and followed the business missions to manufacture the highest quality products and dedicate the most considerate services. 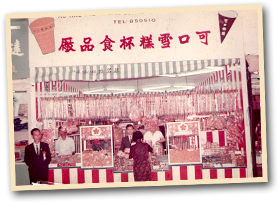 As early as in 1950, Mr. HO invented the first “Folded eggo cone” in Macau. He was a pioneer in the industry. Initially as a night bazaar in a street, STARLAND has since than grown and expanded into a well-known enterprise in greater China. Besides “Customers first“ and “Corporate Social Responsibility”, the success factors are the innovation of business strategies in recent years – commit to the research, development and manufacture of food machinery. It is regarded that science and technology promotes the development of food market in Mainland China and also STARLAND business entering the international market. In the early 1940s, Mr. HO and his family moved to Macau because of the political instability in Mainland China. He started learning the production of egg rolls for maintaining his family. Having achieved success, Mr. HO decided to move his family business to Hong Kong and rebuild the production line in Kowloon Peninsula. In 1953, Mr. HO rented a half shop for his egg roll business in Temple Street, Yau Ma Tei, and then relocated in Reclamation Street. In 1960 Mr. HO successfully invented the first fan-shaped wafer in Hong Kong. It was a exclusive supply in Hong Kong. The HO’s family is famous in the industry. They opened their first factory “Ho Hau Ice-Cream Factory“ in Battery Street and expanded their business in Hong Kong and overseas. Setting up modernized factory with production facilities, such a solid foundation for their future development. A legend could soon begin! In the early 1980s, STARLAND was managed by the second generation of Mr. HO. “Ho Hau Ice-Cream Cone., Ltd” their first “Company Limited“ was registered in 1983. The HO’s brothers cooperated to increase production efficiency, improve product quality and maintain competitive advantage. Because of successful sales launch in the two biggest chain convenience stores in Hong Kong, STARLAND is the first large manufacturer of ice-cream cone in Hong Kong. In the mid. 1990s, they expanded their business in Mainland China, and established a large factory (6,000m2) in Guangzhou with exclusive investment of US$1,550,000. They have achieved remarkable success in the industry – collaboration with many International Food Enterprises. To reach new heights, STARLAND began to research and develop their own production line. STARLAND established “Guangzhou City Pengda Machines Co., Ltd”, which created a new business by company knowledge in production machinery, such as: production devices of fully automatic rolled sugar cone machine. STARLAND, known as an experienced, professional and reliable enterprise, is serving their customers and the local & overseas ice-cream industry by providing professional advices and one-stop technical supports (building factories, supplying raw materials, setting up production lines, installing equipment ...). STARLAND has been developing in the past 60 years. New management are exploring and overcoming many difficulties (e.g. recent crisis in Mainland China food industry). Today STARLAND is a well-known manufacturer of ice-cream cone and the production facilities. With 28 production lines, 95% of machinery & the accessories developed by themselves, STARLAND, combining with modern technology, will keep researching new products. The Group has more than 10 types of product patents and sales network all over the world. Looking to the future, STARLAND is planning to rapidly expand their investment, set up new factories and production lines, and encourage S & D of machinery. STARLAND is creating new era for their prospective business.